I would love to see Appy, Troy, ArkSt even gagstate be real good, but GS Eagles about 10 to 21 points better every game . Then maybe 5 to 6 teams go bowl we Wln and pick up some good players. Except, I never want to see Gag be good at football. They have an astroturfed program with about 28 actual fans attending each game. That program is gaming the system and should not exist. The process I want to see App. go through is a slow one! I notice that no one has brought up the S&P is predicting just under 7 wins. I think the S&P oversimplifies our defense. 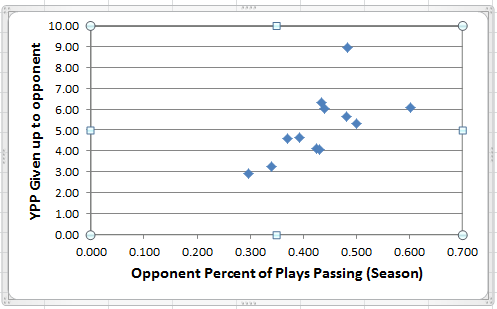 Here's a scatter graph showing our YPP given up to each of our opponents and their percentage of passing plays on the season. I didn't include Clemson. It's not even subtle. Now when you change that to percent of passing plays used in a game against us it doesn't look as obvious but I've remarked earlier that I thought that teams that used more 4-receiver sets gave us more problem on defense and that looks like that could be true. I think we're going to be stout against the more run-oriented teams (like ULL) and that will help us win games. I hope we will get better there, but I'll say I have a strong feeling Chip Lindsey will run the ball more at Troy, and App State could be the type of offense that could give us problems but I just don't think they have the receivers to be dangerous (yet). I feel like we be a better team on O and D and still have a worse record than last year. The likelihood of us NOT throwing an interception or leading the world in takeaways is high. Perhaps we can improve enough on O and D in other ways that can balance coming back to earth in the turnover thing but that has to be played out on the field. I do feel like Year 2 in these systems of DeBesse and Sloan will be huge in and of itself. I also realize how VERY CLOSE we were to being a 4 or 5 loss team. That’s sports .... bounce of the ball .... heroics or lack thereof. I still feel like a 7-5 year would be a good year and an 8-4 would be great and a 9-3 year would be awesome. I cannot see us wining 10 or losing 6. This. We could legitimately be better and still have a worse record. No UMass this year and Troy, App, and Ark State on the road. We will be much better on both sides of the ball, that improvement will off balance a turnover or two. I doubt we go into LSU on opening day and upset them, I think we can beat Minnesota in game 3. I'm not worried about any SB team other than Appy, especially playing up there. Any where from 8-4 to 10-2. I think Minnesota can be a toss up. I'll go with 10-2 or 9-3.